We are approaching the Roof of the World, the Pamir plateau. It makes us nervous and exciting and we are a little bit worried. At the same time other people have cycled here as well so it will be okay… Won’t it? We only know that our preparation ride from Dushanbe to Khorog was tough, very tough. Spending 9 days roughing it on the M41 to Khorog instead of our planned 7 cycling over rough roads and going slow. 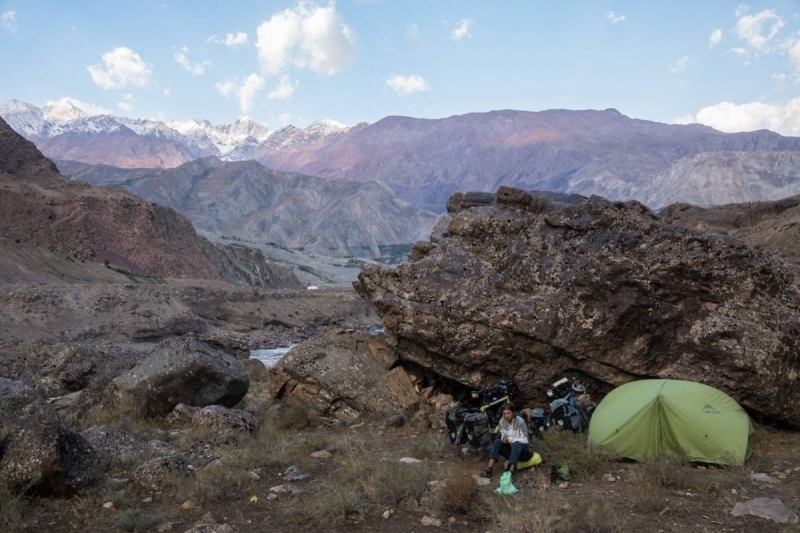 At the same time we are experiencing real Tajik life on the road traveling through small villages and we have come very close to Afghanistan cycling just on the other side of the border river. We have been treated to amazing scenery and are now preparing ourselves for the next leg of the trip. Cycling in this part of the world you can really feel the strength of history and what influence it has had on this region. From the great Silk Road in early times to the influences of the Soviet Union far more recent. 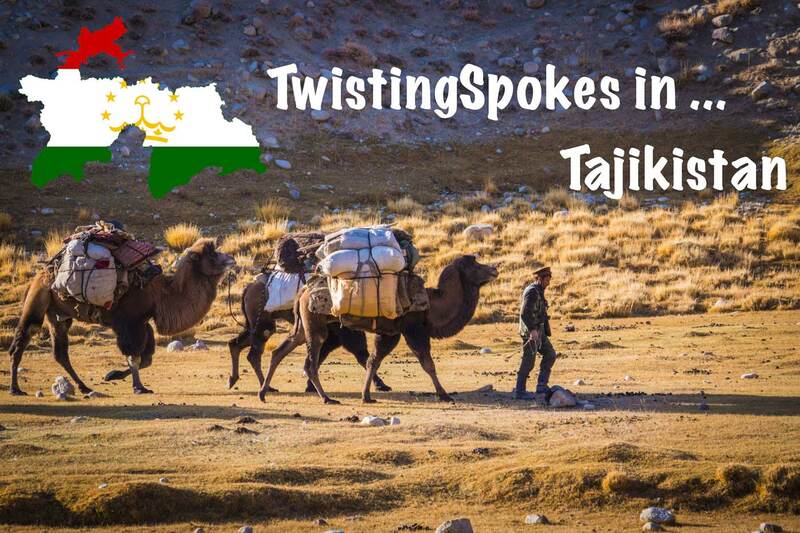 Nowadays Tajikistan is a country not many people know a lot about. We were amazed by the size and bustle of the capital Dushanbe which is in shrill contrast with conditions in the rest of the country. Apparently there is a lot of aid work going on. We wonder if this aid work is bringing what it should. We have seen multiple signs along the way of European initiatives to install e.g. water systems and emergency stockpiles. Often the water systems already do not work anymore. One example was financed by the Dutch government and there was no water coming from the water point while it was installed in 2013. The M41, or more commonly known Pamir highway, was built by Soviet military engineers between 1931 and 1934, in order to facilitate troops, transport and provisioning to one of the remotest outposts of the Soviet empire. The road from Dushanbe to Khorog can be split in three parts. The first part of the M41 out of Dushanbe was a slow climb, we were together with Trikeiteasy, we were feeling okay and looking forward to what was to come. We were camping together, learning from each other habits and techniques and having fun. The contrast here was very strong. Leaving in the morning and cycling in between large buildings and on good tarmac roads. Within 60 kilometers we were in the countryside and the mountains were starting to dominate our view. Also the road was becoming less kept with patches and gravel. We have been treated to experience the migration of herds from their summer stay in the mountains back to their villages. Especially the first few days we encountered three or four groups with many sheep, goats, donkeys, cows, horses and dogs. You could feel it was really a party for the men to undertake this mission home. Their yurt was packed on the donkeys and they were very energetic. The cars were not very patient but the herds reacted well to us and we could get by smoothly. The road was getting more tough, rougher roads with sometimes big cobbles which were hard to cycle on. And then the worst thing happened. Trikeiteasy had mechanical problems and were going to hitchhike further. So we were all by ourselves again just before the steep ascent to the pass. In part two the road was the roughest of the whole section because there is not much traffic that takes the Khaburabot pass, because of a better maintained road going south of Dushanbe. We made it a few hundred meters up the pass and luckily found a camping spot across a small river we waded through. We slept and Martin was really feeling bad all night. The next morning he was still feeling like crap and we had to climb from 2100 meters to 3200 meters. He was feverish and the only way was up. When we made it to the top we quickly descended down to find a warm place so Martin could sleep and then a camping spot for the night. Luckily Martin was feeling better the next day, so we descended all the way down to 1300 meters, did some shopping in Kaleikhum and were on our way again. In the villages we come across the children are very active. In Tajikistan 35% of the population is under 14 years old and that is very visible in the small streets. Small children line up for high fives, shouting hello, hello, hello, hello, hello and running after us. Tourism has had an influence here. 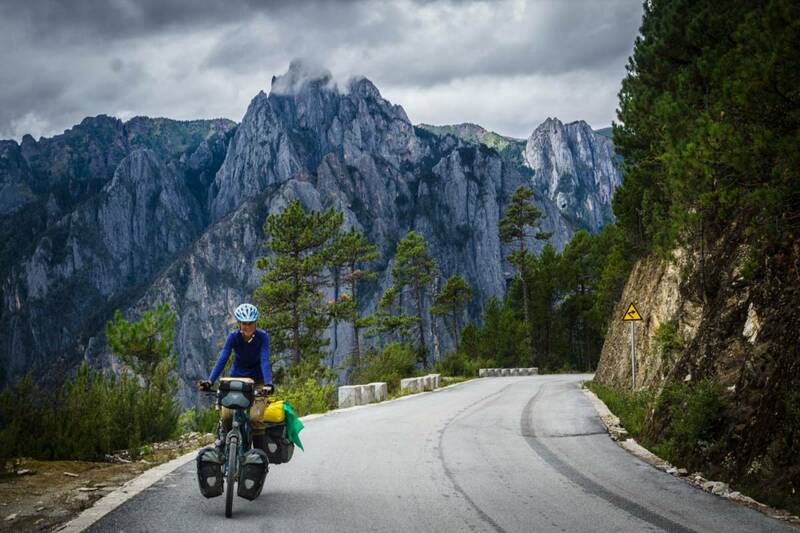 In some villages they ask for balloons, photos, for things we have on our bike. Alas we are not a gift store… We have been trying to avoid the high fives because, although they seem innocent, the children might carry bacteria that we are not used to. So we smile, wave and say hello and cycle on. The final few days were again up and down along the river. Very frustrating because a lot of effort and not so much elevation but the scenery gave a lot of good motivation. We hadn’t realized that already now we would be following the Afghan border. It has been very interesting to see another world on the other side that we mainly know from news reports. Many times we have been watching with our monocular to the other side and seeing men on motorbikes or just walking along this amazing mountain road. They often wear typical Afghan clothing. The houses are very traditional and here you can see the influence of the Soviet in a Tajikistan. Here there are mainly concrete square houses in the small villages. On the other side it is all mud brick and it looks very pretty. Also technology is far away and some parts of Afghanistan are connected with Tajikistan for the energy supply. 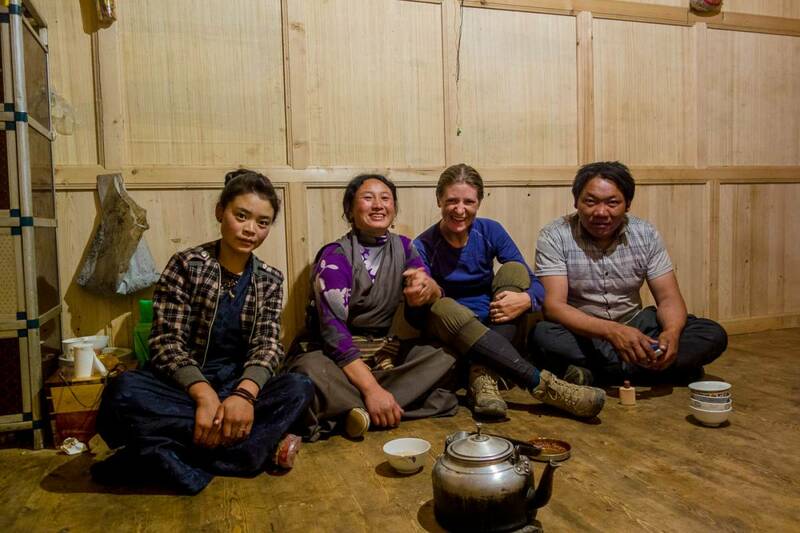 Finally we made it to Khorog where we could rest up at the Pamir Lodge (which has definitely seen better days). This was very necessary because we both haven’t been retaining enough energy in our bodies from the food. So time to eat and sleep and get ready for the next leg. Happy to see that even in tough conditions you still enjoy your ride! We think a lot about you! You will need to cross Afganistan or China for a very little?